SEATTLE--(BUSINESS WIRE)--Mar. 2, 2017-- (NASDAQ: AMZN)—Amazon today announced a new initiative to generate clean energy by installing solar panels on its fulfillment facilities around the world. 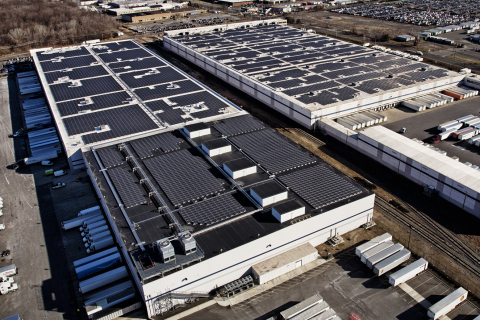 The company plans to deploy large-scale solar systems on rooftops of more than 15 fulfillment and sortation centers in the U.S. this year and is planning to deploy solar systems on 50 fulfillment and sortation centers globally by 2020. For high-resolution imagery of the project, visit www.amazon.com/about. Aerial view of two Amazon fulfillment facilities with solar systems on their rooftops. Photo credit: P2 Photography.